It’s one of the greatest books ever written, but not as you know it. Many intend to read this classic of modern literature but few succeed; at nearly 1,500 pages and well over half a million words, it’s little wonder that so many copies remain unfinished. 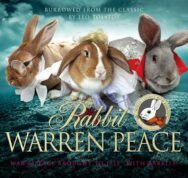 Now, Tolstoy’s greatest work comes to you in a brand new package, retold with rabbits, in this new accessible version suitable for all ages.